Everyone has their own travel personality. There’s always one person who gets lost, another who overpacks, a third who lives to create travel itineraries, a few who prefer to get up early than stay out late, etc. Figuring out what type of traveler you are is the easy part with websites like Buzzfeed that create a Travel Personality Quiz. Finding your own travel buddy, someone who you can travel with and they can travel with you, can be a challenge. Here are a few things to consider on your travel buddy search before you say “yes” to the stress of planning a trip. Just as some friends wouldn’t be the best roommates, they also may not be the best travel buddies. What’s your friendship history? Have you all gone on trips before? Do you all fight often? When you do, is it resolved quickly or does the tension fester? Disagreeing with friends is inevitable and completely natural so I wouldn’t count out a friend because of an argument. 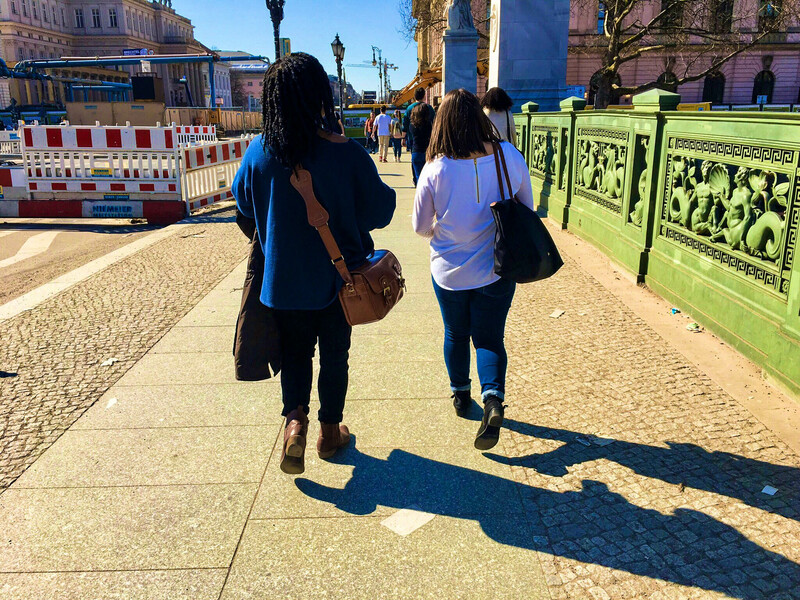 However, if you and your friend are constantly budding heads in your home country, it’s something to consider when deciding if said friend can be your travel buddy. The smallest things such as where to eat or how to get to a tourist attraction can cause rifts. Evaluate your friendship chemistry before booking an international plane ticket together. Tip: If you are traveling with people you just met (i.e. a study abroad program or a fellowship like Fulbright) it’s more trial-and-error since y’all are initially strangers! Money, money, money! Whether your flight is domestic or international, traveling requires money. Are you all flying together? How much do you want to spend on lodging? How will you all pay if you can’t split the check at dinner? You and your travel buddy should work together to create a travel budget. This is not time for pride, ego, or fear of being considered “cheap.” If you’re not looking to shop, discuss it. If you want to save money and stay in a hostel or splurge on a hotel, break down the costs together. You all should be on the same page when it comes to funding your trip. Don’t be peer-pressured into spending beyond your means. We are all our own people with our own identities. We have different races, ethnicities, hair types, sexual orientations, genders, sexes, religions and political ideologies. These details can impact how you and your travel buddy are perceived abroad and how you perceive other cultures. I had a stronger reaction to seeing blackface than other people in my program. As a black woman I didn’t attract the same attention as my blonde-haired, blue-eyed counterparts and lighter-skinned women of color. These can be tense encounters that come at the most unexpected moments. Talk about these possibilities beforehand to be prepared to support your travel buddy or have them support you if a situation does arise. Your traveling pace can change depending on the location or the person with whom you’re traveling. Some people can survive on minimal sleep while others need a midday nap. Sometimes you have 48 hours to explore, other times you have 4 days. With your travel buddy, plan accordingly. Do you like to be up early to see all the attractions or party the night away? Do you mind sleeping on transportation to maximize sight-seeing time? These are questions to consider because not everyone can keep up or want to slow down. Even though you are traveling with someone, you may still need a little “me” time to explore. Yet, this can be perceived as being annoyed with your travel buddy and not wanting to hang around them anymore. Your travel buddy needs to understand your personality and vice versa. They can only be supportive and understanding if you tell them, “hey I may want to walk around on my own for a while.” Communication is everything. If you know that you’ll need your personal space, let your buddy know to avoid any unnecessary tension. Thanks for reading! Pin for good luck to find your own travel buddy!